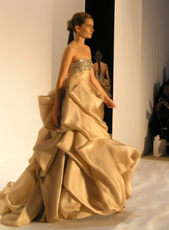 Fashion Designers Chado Ralph Rucci and Christian Siriano created a definite buzz with their sensational Spring 2010 Collections during Mercedes-Benz Fashion Week in New York. Sensuous fabrics and lush designs provide ample reasons to dream and something to look forward to for Spring 2010. Designer Ralph Rucci for Chado Ralph Rucci clearly wowed the audience on September 12, 2009 with his impressive collection of 54 looks for Spring 2010 during Mercedes-Benz Fashion Week in New York that had guests on their feet and applauding in appreciation when the designer took to the runway at the show's finale. His collection for Spring 2010 is elegance personified with structure, style, and feminine silhouettes that feature a color palette incorporating neutrals of black, white, taupe, beige, ecru, pearl grey, vanilla, and pale pink, and enlivened with red, terra cotta, bronze, citrus, and yellow. Ralph Rucci deftly uses fabrics to create statements and eye-catching details that include shredding silk tulle and chiffon to sculpt into layers, creating columns with silk chiffon that is tucked and then topstitched, adding hand-cut paillettes of chiffon to create movement, creating braids of leather and woven silk, and adding embroidery panels that depict a shoji-screened tea house to a silk gros de longres raincoat; he is a master of artistry and design. A few of the many highlights of his remarkable show included a Taupe feather dress; Black double-faced wool crepe and pin-tucked tulle dress; Taupe chiffon and horsehair dress; Black braided chiffon suit with white encrusted shell; printed caftan with white silk crepe pants; Terra cotta double-faced wool crepe jacket with taupe tulle and horsehair skirt; Eroded silver paillette dress and black marquisette coat; and Ecru gazar dress. Then there were his sumptuous, glamorous gowns - a Red and white chiffon gown; Black matte jersey gown; Black matte jersey harness gown; Black and gold kabuki gown; Strapless vanilla silk crepe geisha gown; Citrus gazar genji gown; Printed gazar gown with black paillettes; and White double-faced sponge crepe vertebrae gown. Artistic details included hand-woven silk brocade obi sashes for the gowns made in Kyoto, Japan by Hiroto Rakusho that incorporate natural elements of lacquer made from tree sap, and gold, silver, and platinum metal leaf that is pounded and then rubbed onto the surface of the fabric. Among the many notables in attendance at the Chado Ralph Rucci show were Martha Stewart, Steve Harvey, and Rachel Roy. 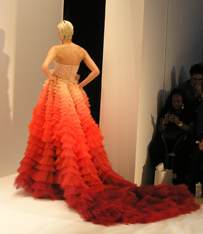 Christian Siriano's collection for Spring/Summer 2010, can be summed up with one word - gorgeous, although stunning, sensational, and opulent also come to mind and aptly define his collection of 36 looks. Just 23 years old at the time of his Mercedes-Benz Fashion Week show in New York on September 12, 2009, this fourth season winner of Project Runway has a clear vision when it comes to design. His muse was luxurious Mediterranean travel using neutrals of beach, blush, khaki, and white, with blues, fuchsia, and orange enlivening the color palette. Lush details are among his many design strengths and his use of sensuous fabrics- silk chiffon, organza, silk charmeuse, silk knit, satin, metallic linens, and jersey, expertly drape the body. Gorgeous dresses, suits, and shorts deliciously paired with shoes and ankle boots and booties from his line featured "bull horn" heels, exposed platform soles, and upturned toes, and large hats by Heather Huey, reminded me of Bette Davis as the elegant Camille Beauchamps in the 1942 film, Now, Voyager. Jackets feature fabulous lapels; blouses have flirty flounces, pleats are seen throughout his collection on a pleated waist blouse, pleated shorts, shirtwaist with pleated shoulder; and side pleated skirt; trousers feature slim leg, as well as wide leg; and dresses are seductive in halter and strapless styles. His gowns were stunning and included a Silk chiffon-layered goddess gown; a Satin faced one shoulder bubble gown in oceanic print; and three head-turning gowns, any of which could have been his grand finale, a Satin-faced organza draped strapless gown featured a beaded bodice and was a standout in blush with its softly draped curves; a Chiffon and tulle-layered ombre gown was dramatic in blush and volcanic with its vibrant color and long diva train; and lastly a Satin-faced organza draped flounce gown in a rich volcanic print. Among the many notables at the show included Tim Gunn, Tori Spelling, Mena Suvari, and the Brazilian model Alessandra Ambrosio wearing a draped gold lame mini dress by Christian Siriano, who took time to chat and pose with Edward F. Nesta of Luxury Experience Company.